Looking for something light in a season full of heavy...heavy.......heavy food? Try this out. It's easy and super quick. 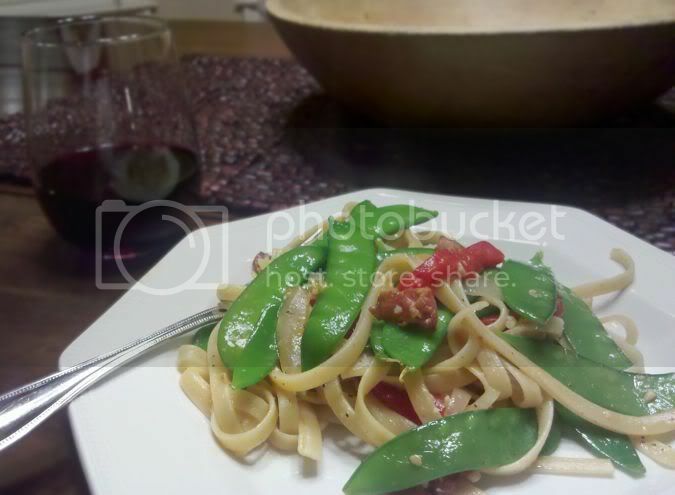 Just add a salad (or not - the snow peas pack a nice punch of veggie green! ), your favorite glass of wine and you're set to go. 1. Cut the roasted red peppers into 1/4" wide strips. 2. Cook the bacon in a large dutch oven over medium-high heat until crisp (about 2 minutes). Remove and set aside for later. Add the onion and garlic, saute 1 minute. Add the bell peppers, peas, and broth; simmer 1 minute. Stir in the pasta, reserved bacon, cheese, salt, pepper, and red pepper flakes to taste.